One of the surviving Lost Boys of Sudan, Ayuen escaped ravages of civil war at age 5 years, beginning a 1200-mile odyssey on foot first to an Ethiopian refugee camp, and later having to again flee for safety back through South Sudan then to Kenya. One of an estimated 20,000 displaced Sudanese children, Ayuen witnessed countless thousands of deaths from starvation, attacks by rebels and wildlife. This genocide continues to take the lives innocent people, including members of Ayeun’s family and friends. After immigrating to the U.S. as a teenager, Ayuen competed high school and received a Bachelors degree from Temple University and Masters in International Peace and Conflict resolution from Arcadia University in Philadelphia. Ayuen currently is undertaking graduate studies at Cornell University. His expertise and engaging classroom presence chronicles Conflict and the Quest for Peace in South Sudan, The Republic of South Sudan: The World’s Newest Democracy, and The Impact of the World Bank on Sustainable Development and Human Rights. 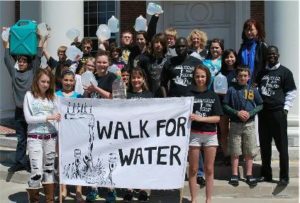 He has worked closely with Gertrude’s students in their annual Walk for Water awareness and fundraising activities. Abdullah is a native of Riyadh, Saudi Arabia, who now lives with his family in Philadelphia. He brings cross-cultural perspectives on life in these two countries, and engages students in open, probing discussions about history, religions, language, heritage, culture – including women’s issues, food, arts, music and more. Especially, he encourages exploration of stereotypes –why they seem so pervasive, and how damaging they can be especially to young people in both countries. As Director of Arab Programs at Global Education Motivators, Abdullah has been instrumental in establishing a partnership with Effat University, which is the first women’s college in Saudi Arabia. Among the workshops he has presented are Arabs in Media: from Aladdin to Terrorists; Arabs in America: Breaking Down Sterotypes; Personal Perspectives on Saudi Arabian Politics and Culture; and The Post-911 Shift. 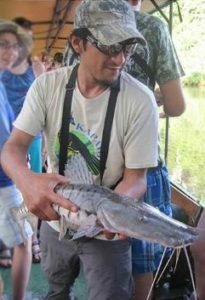 A certified eco-tourism guide and educator based in Quito, Ecuador, Fernando has traveled and provided eco-educational tours throughout rain forest and agricultural environments to groups of all ages. In the classroom he leads students in discussions on subjects including: The Biodiversity of Ecuador’s Amazonas Rainforest, Economic Factors Compromising the Human Rights of Indigenous Peoples, and A Micro-economic Model of an Indigenous Women’s Village. An advocate for health and education, Kabari was born in Nigeria in the midst of upheaval and civil war. After years of living in a refuge camp, he immigrated to the United States at the age of 15, where he attended school for the first time while also working to help support his family. Overcoming odds, both academic and financial, Kingsley eventually gained admission to the Plymouth State University, where he graduated with honors in Exercise Physiology. 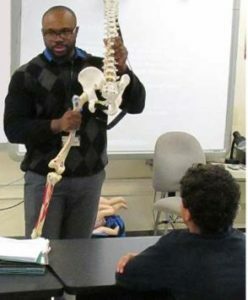 After several years as a physical trainer, he enrolled at the New York Chiropractic College, completing his studies in 2014. He has shared with many audiences his Tale of Survival, and also speaks about Environmental, Social, and Political Degradation by Big Oil in Nigeria. Inspired by working with children in Gertrude’s classes, together they founded the Education Prevents Recruitment project, which provides educational opportunities for Ogoni children of southeast Nigeria. An advocate for Human Rights and Peace, Okema was born in Gulu, Uganda. He was abducted at the age of 9 and spent six months in captivity as a child soldier before escaping. One day he and several other orphaned children were found by Abitimo Odongkara, herself a Ugandan refugee, who had returned with the hope of founding a school. Denis was among the first students in what later became the Upper Nile Institute for Appropriate Technology School (UNIFAT) and has worked closely with Gertrude’s students in helping support this school. A motivational speaker working with Civil Society, Okema shares expertise on The Effect of War on Children, Using Social Media for Social Change, Justice and the African Experience, Methods of Conflict Resolution, Effects of Conflict on Economic Empowerment and Sustainability, The Oral Traditions of African Folktales. Rebecca’s family was able to escape to the USA as refuges from the Ugandan reign of terror brought on by Idi Amin. However, she never forgot the suffering her friends endured, and after finishing high school she earned a Bachelors of Arts in Special Education at Antioch College. Upon the death of Amin in 1986, she returned to her home in Northern Uganda and started teaching local children; her first classroom was the open space under a shade tree in the village of Otwee. Violence was still prevalent throughout the country, and most of her students had never known peace and security; nor did they have the most basic resources such as books. Many were orphans, and word spread that they could find safety and sanctuary in Rebecca’s school. 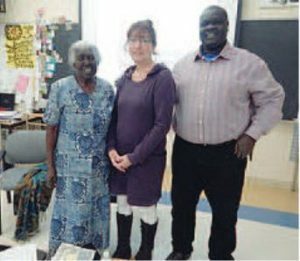 From this rudimentary beginning, Rebecca founded the UNIFAT elementary school (Upper Nile Institute For Appropriate Technology), which now enrolls over 3000 students. Although the level of civil violence has subsided, still today many of the students at UNIFAT are orphans due to ongoing armed conflicts and diseases. Youth service projects from many countries provide financial support for these students. Sadly, Ms. Odongkara died in July, 2016 at the age of 86. Chief Tapinko, the leader of over 5000 Maasai in central Kenya, and his wife Cicilia Seleyian, help westerners understand both the traditions of the Maasai and the challenges that many of the approximately 600,000 Kenyan Maasai face as the combination of drought, grazing restrictions, and modernization threaten their nomadic lifestyle and they increasingly live in more permanent communities. While these offer improved opportunities for formal schooling and better access to health care, other essential survival skills, for example raising livestock and crops, require developing new approaches. Increasingly, young Maasai are torn between traditional and Western cultures. 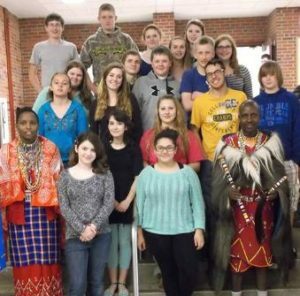 Part of Chief Tapinko’s goal of bridging these gaps is aided by the Maasai Good Salvage Outreach Organization. This not-for-profit promotes the preservation of many Maasai traditions, but also leads educational campaigns against those cultural practices that are not consistent with good health and human rights.